This week I joined Kristi on one of her WWOOFing adventures, and since I tell people I’m pregnant too, it’s okay that I’m posting to the Wwoofing While Pregnant part of this blog! Our travels found us venturing to Violet Town, Victoria, for the three day Labour Day Weekend (yes, spelled with a U). It was a last minute change to our plans, and Kristi was very excited since she had really been wanting to go to this farm and had been told there wouldn’t be any openings for WWOOFers before the baby was due. 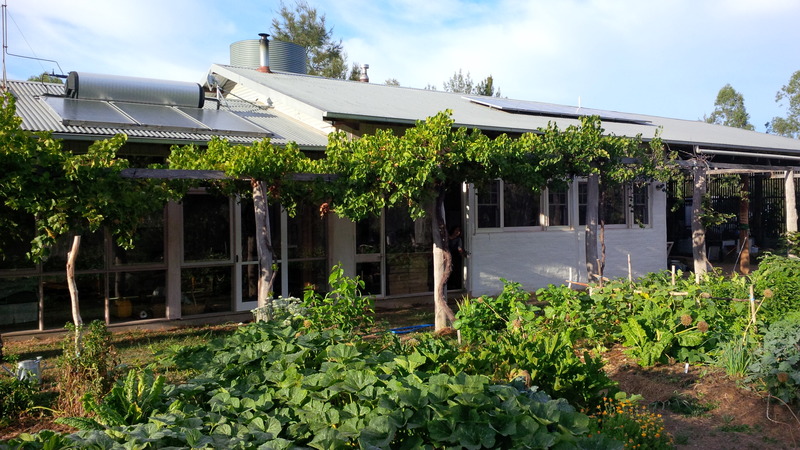 David Arnold, owner of Murrnong farm, runs a 20 acre organic permaculture farm complete with fruit orchards (including olives), nuts, veggie gardens, goats, chickens, and beas. His original concept was to develop a permaculture subdivision, but due to bureaucratic challenges he has become content with more informal arrangements of people desiring short- or long-term stays on his property. The thing that makes his farm an organic farm is of course that no pesticides or herbicides are used, and the thing that makes it a permaculture farm is that its design uses ecological principals where interrelated systems help increase yield and decrease maintenance and intervention. Between Kristi’s WWOOFing trips, the Joel Salatin speech we attended, and all the Libertarians I met during my involvement with the Ron Paul campaign, everybody always seems to be talking about raw milk! Well, I told Kristi that for my birthday I finally wanted to see what all the fuss was about. So, it was fitting that the first thing we did was to milk a goat. Francesco, an Italian WWOOFer living on the farm, showed us his technique. I struggled at first but soon managed to find the technique required to work the milk down, shoot it into the bucket, and alternate between hands without missing my target. Although the basic technique isn’t too difficult, mine was pretty rough around the edges. Kristi’s was a little more refined since she got a lot of practice at her stay on Kate and Alex’s farm a couple weeks prior. David has two goats, Rosie and Twitchy, who give milk every morning at 7am and then spend the rest of the day tied to a mobile mini enclosure that gets moved throughout the farm as they eat the grass. We decided when we have our own farm it would be nice if they could have a little more freedom to wander, which of course would require more investment in fencing. Throughout the trip, I got to see first-hand just a few of the many uses for goat’s milk. I was shocked at how easy it is to make yogurt. You literally just heat about 750mL ish of goat’s milk to about 43 C, mix in a healthy spoonful of yogurt (or culture if you don’t have any already), and store for about 8 hours in a warm environment. That’s it! And once you’ve made your first batch of yogurt you just use that to make the next day’s. The group has yogurt each morning with their breakfast. Okay, so making cheese is a little more involved than yogurt, but I could see how once you’ve got a few good recipes it’s not all that difficult. 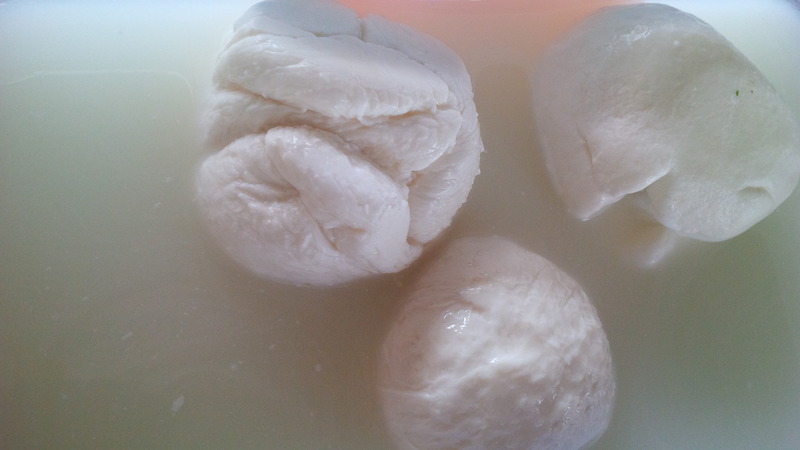 During our stay, we had some delicious mozzarella cheese made from goat’s milk, and Francesco was also busy experimenting with another kind as well. Of course, then there’s just plain old unadulterated milk. 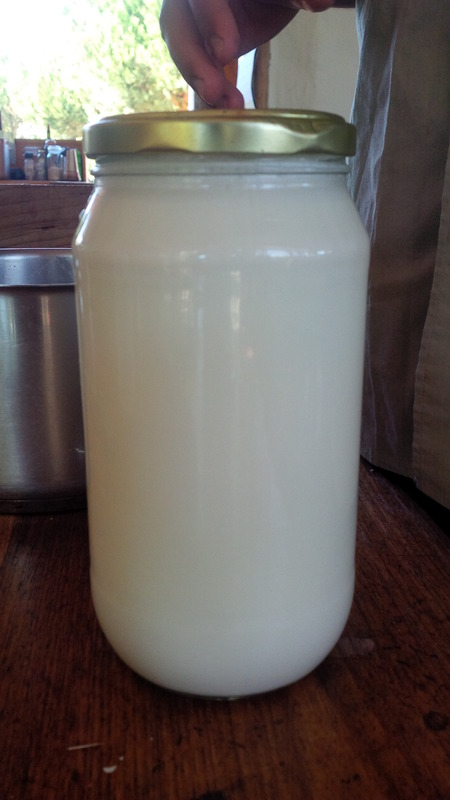 Many people believe goat’s milk to be superior to cow’s milk for a number of reasons I won’t go into here, but suffice it to say I finally got my glass of raw milk. 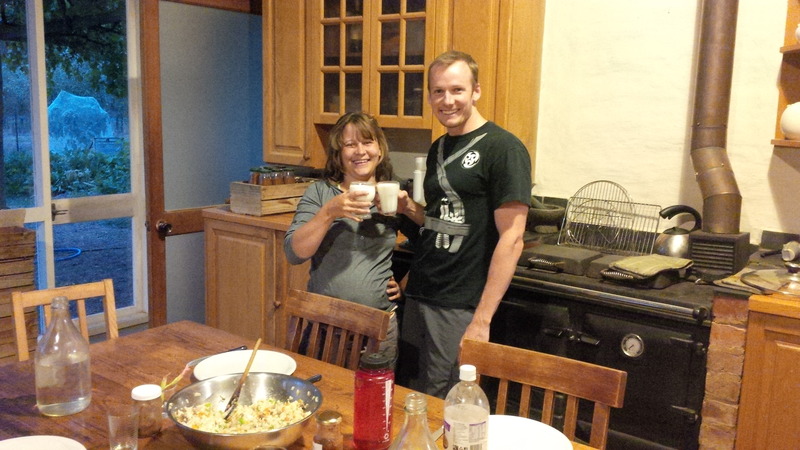 Kristi, Baby, and I all enjoyed a glass with dinner on our first day on the farm. After milking the goats we spent some time in the fruit orchard tending to the trees. Various breeds of apples and pears were currently in bloom and each day people would go through the trees and pick out any fruit that had gone bad due to worms, birds, or other animals pecking away at them. We would also pick up any fruit that had fallen from the tree. 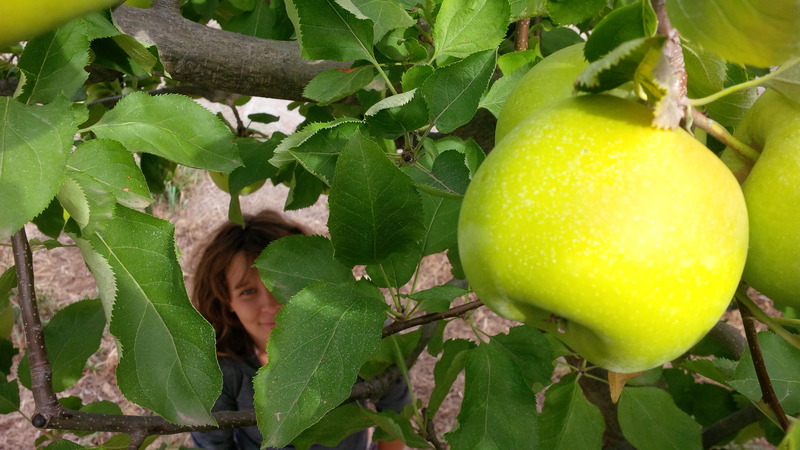 Of course, true to permaculture style, there are plenty of uses for the “bad” fruit. The fruit preserves warrant special mention, since there is still a lot you can do with less than perfect fruit. Once you cut open the fruit it’s very easy to remove the part that’s gone bad. You’re then left with plenty of good fruit you can use. Hoang (sp? 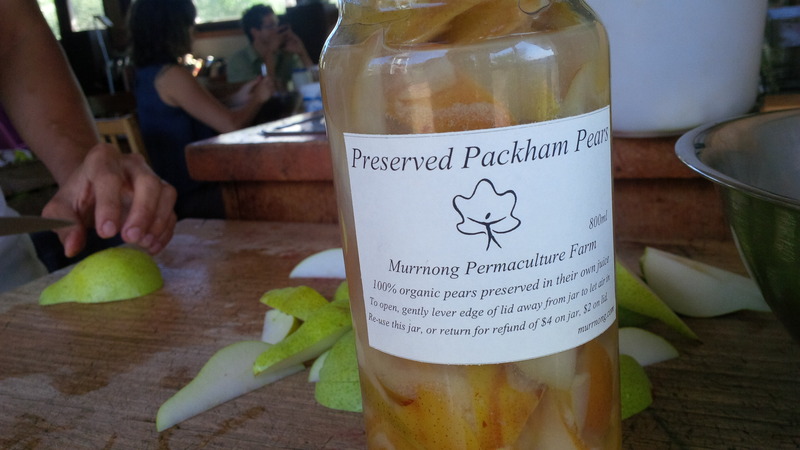 ), a WWOOFer from Hong Kong, was making pear preserves that will keep for several months at a minimum. Remove the bad portion of the fruit. Blend part of the fruit into juice. Stuff slices into a jar and top the jar with the juice. Bring some water to a boil and let the cans simmer for about 30 minutes. Normally, you would just use water instead of fruit juice, but David has found that using juice gives it a darker color that helps it sell better. Plus, I would imagine fruit floating in juice would taste a little better than just floating in water. 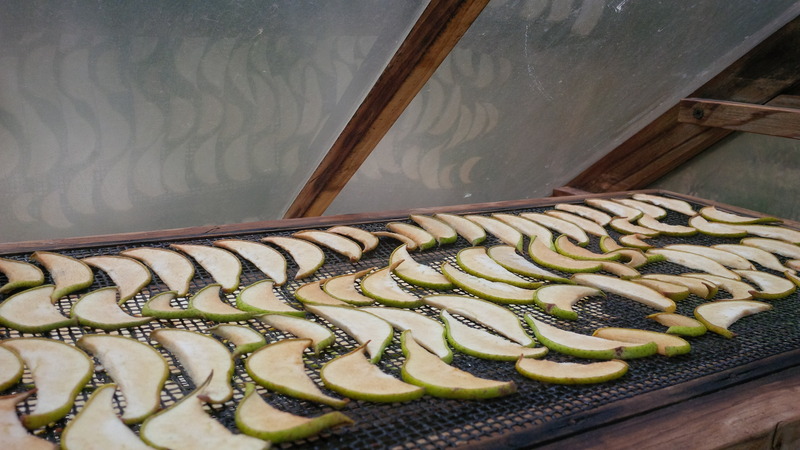 Another way of preserving fruit is by drying it. I may be getting the exact timing slightly wrong, but you basically dry thin fruit slices for a few days, then freeze them, and then bring back to room temperature and you have preserved the fruit. I’m going off memory here so this may be worth double-checking. Blend the fruit and mix with some egg-whites. Chop up the ice, mix in a little water, stir it up, and put it back in the freezer. 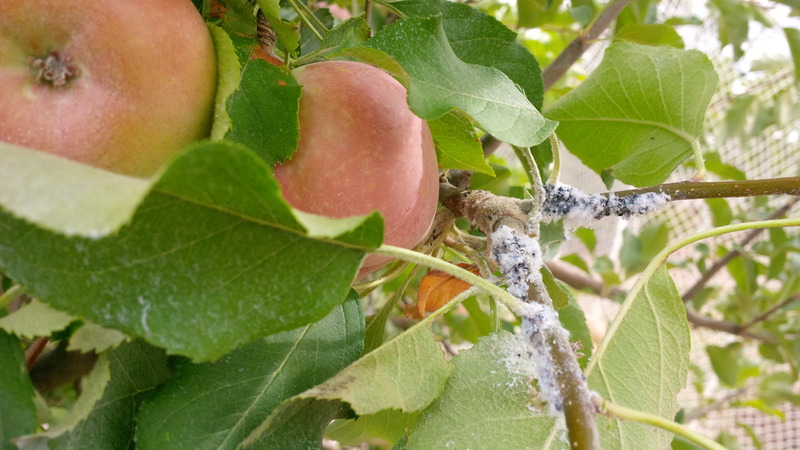 When picking apples I did notice some white fuzz growing on the trees. It didn’t look right so I took a picture and made it a point to ask David later in the trip. Turns out it is indeed something to worry about called Powdery Mildew. He said his first course of action will be to give the trees some nutrient rich compost. The thinking is akin to a holistic approach to medicine and to help the tree help itself before resorting to stronger medicines. If that doesn’t work, he’ll have to spend some brain power researching ways to fix the problem without using pesticides or herbicides. To do so would breach rule #1 for operating an organic farm. Perhaps Kristi will learn more in her remaining time on the farm. 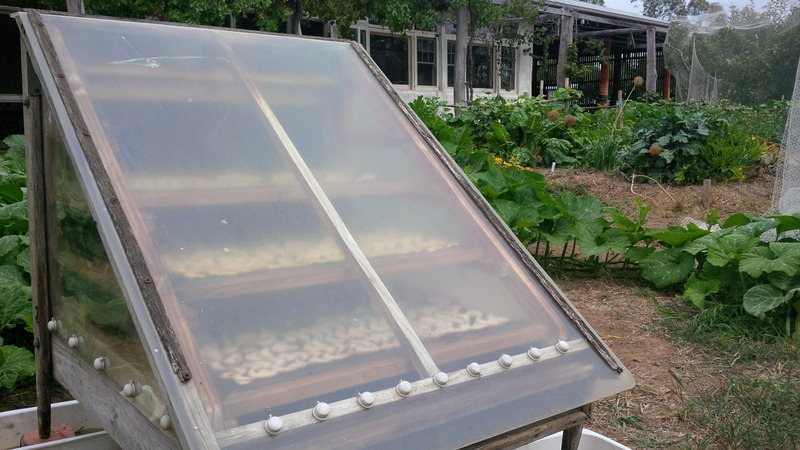 Much of the afternoon on the first day was spent scraping wax off of beehive frames after a massive breakout of wax moth. 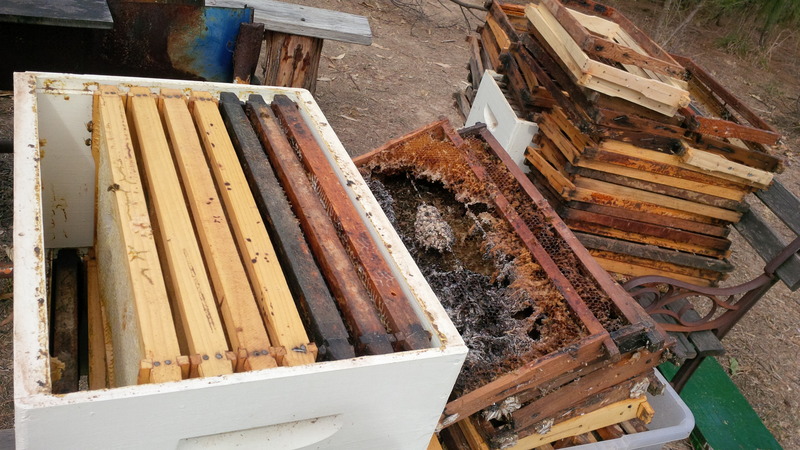 This is an occasional infestation that ruins beehives because the bees must expend all their energy fighting off the moth infestation. The result can be seen at right in the honeycomb that turned black as a result. Normally it is a clean yellow color. David explained that these infestations happen when conditions aren’t as sanitary as they can be. His frames were bought secondhand and not that great, which made him more vulnerable to the infestation. After scraping the wax from the frames, Francesco boiled the wood frames to remove any remaining wax and sterilize any moth remains still in the nooks and crannies of the frames. With my being so interested in alternative home construction concepts, I spent some time trying to understand David’s setup. In the picture at right, you can see his solar hot water heater on the left, the flue of his wood-burning stove in the middle with a water tower just behind it on the other side of the house, and some solar panels at the right. Although his electric solar panels net-in with the grid, the rest of his property is essentially off the grid. In doing the dishes several times and taking one shower, I was impressed at how well the solar hot water heater works. On overcast days the wood-burning stove also heats the water through a thermosiphon connecting the stove to the solar hot water heater. You could feel the effect of this the day Hoang was using the stove to preserve fruit – we had piping hot water as a result! This is actually the exact same setup I was planning on using at our homestead someday and it was reassuring to see it in action. One thing that is different than how I might picture the perfect setup is that the water system is not fully gravity driven, due to the fact that the terrain is so flat. Potable water for the house is collected from the roof and stored in a large tank on the ground, water from this tank is periodically pumped into one of the two tanks on the water tower, and then gravity-fed to the house. The other tank on the water tower draws its water from the dam, which is also periodically pumped into the tank when it gets too low. This system allows them to only rely on pumps (and gasoline) infrequently and then gravity does the rest. The only exception is the orchard, which is also pumped water. For your viewing pleasure, I’ve included a belly shot on one of our visits to the dam. 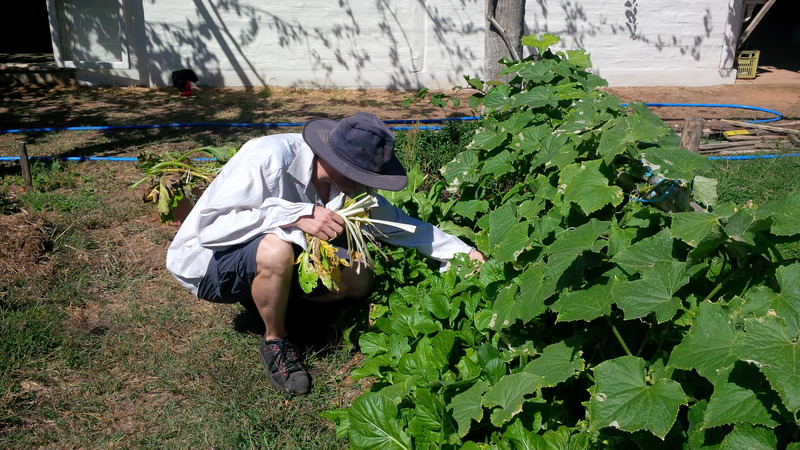 Digging down a few centimeters is a good way to tell if you’ve watered the garden enough. Watering tomatoes at their base and not directly onto the leaves is preferable because moisture can cause fungus growth on the leaves. Using more mulch helps prevent soil erosion, which is probably why our potatoes at home have been getting exposed to light. Onions are best in their own bed (or with other members of the onion family) and may explain why all our onions at home died. Any weeds, leaves, etc. from the garden can go to the goats and/or chickens. After collecting a bunch of zucchini stalks that had gone bad, along with some bad cucumber leaves and wormy apples, I took all the leaves over to the chicken coop for composting. 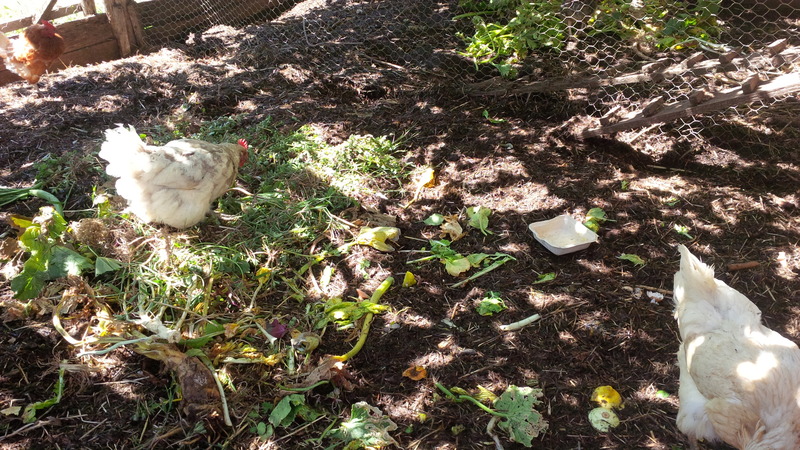 David has 11 chickens, all of whom are hard workers when it comes to scratching through plants and turning your waste greens into beautiful compost. 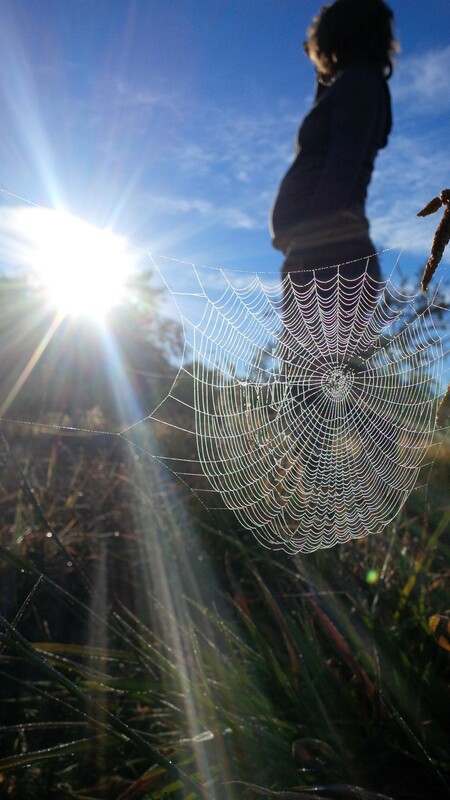 In addition to making you new soil, they also spend much of their time roaming the orchard taking care of little bugs that could cause problems for the fruit. And let’s not forget their egg-laying. David gets about 5 eggs per day from the 3 hens that are currently laying. The second form of compost the farm produces is mostly from wood that’s run through a wood chipper. 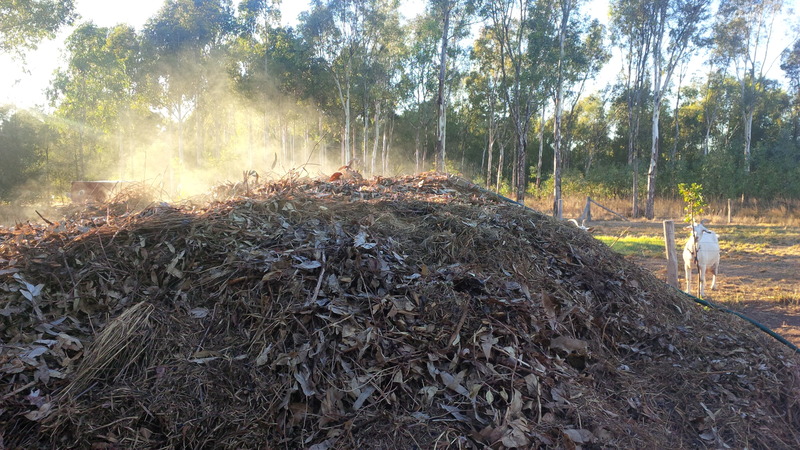 At right you can see the steam coming off the compost pile as the bugs are hard at work turning all the waste into nutrient-rich compost to feed future garden beds and trees. And speaking of hot, steamy compost, this trip was also my first time using a proper composting toilet! Don’t get me wrong, I’ve squatted over a few holes in the ground in my time (that trip to Peru comes to mind), but I’ve actually never used a composting toilet despite all the reading I’ve done. First off, it really does put the throne back in the, well, throne. You literally have to walk up a few steps to sit atop a big box. The only worry (in this particular case) is somebody busting through the canvas curtain and catching the King Without His Clothes. The biggest benefit however, in my opinion, is being able to sit without worrying about being splashed – clearly the worst part of the conventional toilet experience. Water of course is used to aid in flushing and also contain smell, which to my surprise wasn’t a huge issue. I didn’t think the odor was bad, which is helped by sprinkling sawdust over your business. Am I fully on board with a compost toilet? Philosophically: yes. Do I think the occasional house guest would have reservations: yes. Perhaps the homestead could have both options available. After all, “humanure” does provide valuable composting. Perhaps a hybrid solution would be best with traditional flushing toilets to a septic tank as well as a composting toilet outdoors for the committed. Next time I’m on the throne I’ll have to give this subject some more thought. To end the Holiday Weekend, the two other WWOOFers, Kristi, David, his daughter, and I went on a bush-walk (Australian for “hike”) along a creek bed 40 minutes away from the farm. It was a relaxing way to spend the second half of our last day on the farm. I truly enjoyed my limited time on David’s farm and in a very short amount of interaction with him learned a great deal. I hope I’ll be afforded the opportunity to come back to his property and help out in any way I can and in doing so come back home with even more gems of experience. In the mean time, I look forward to seeing what Kristi is able to learn over the next week or two as she continues to live and work on the farm.